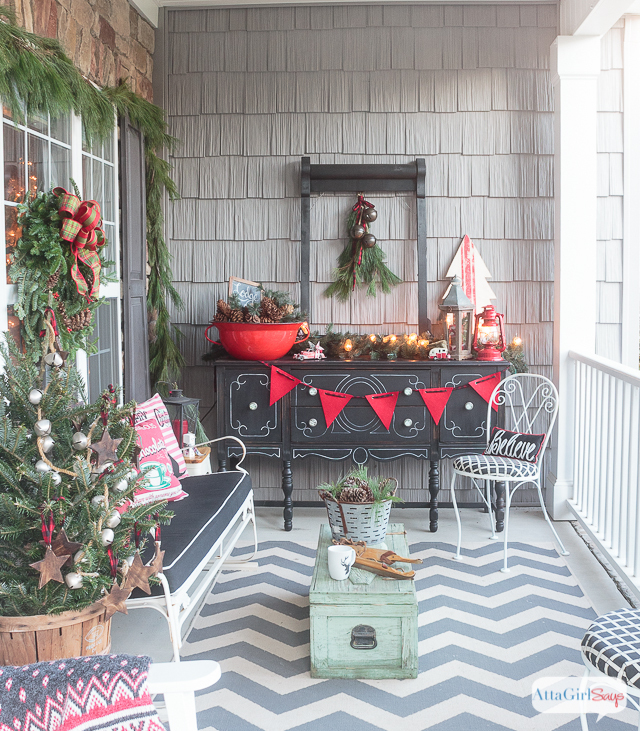 Join me for virtual tours of eight bloggers stunning porches decorated for the holidays. 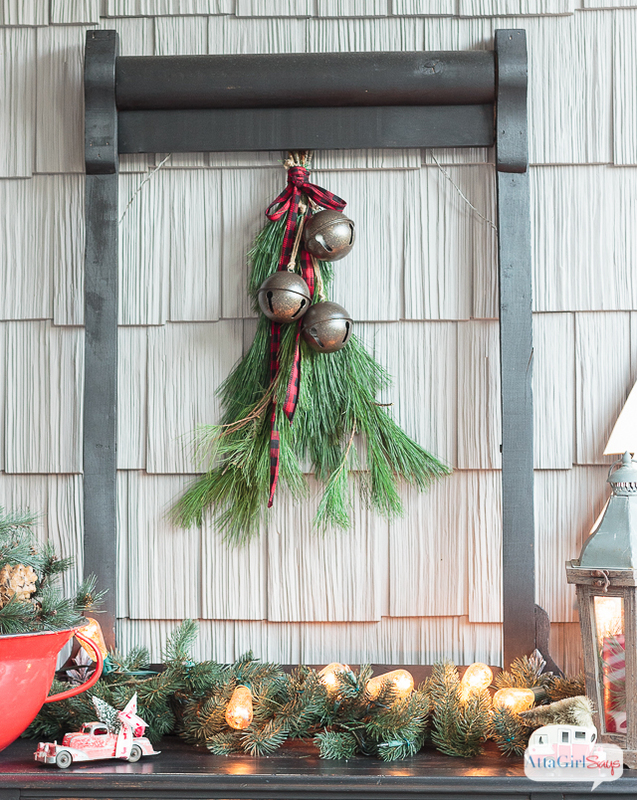 You’ll find lots of Christmas front porch decorating ideas — farmhouse, vintage, rustic, French country and more. I’ve heard of being house-proud, but can you also be porch-proud? Because I’m pretty enamored of mine, and I could tinker out there all day, especially around this time of the year. I showed you a sneak peek of our lodge-inspired Christmas front door decorations earlier this week. Now it’s time for me to show off the entire space. 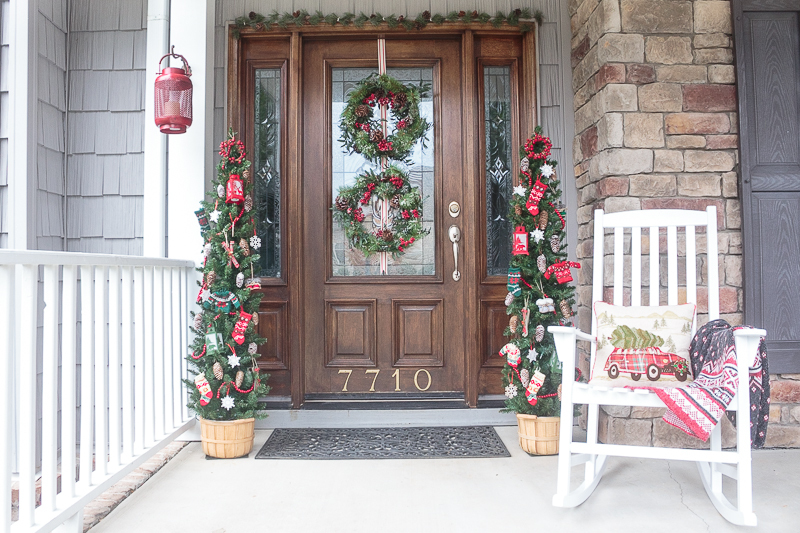 And I’ve invited some friends to share their front porch decorating ideas, too, as part of a virtual Christmas Porch Tour. 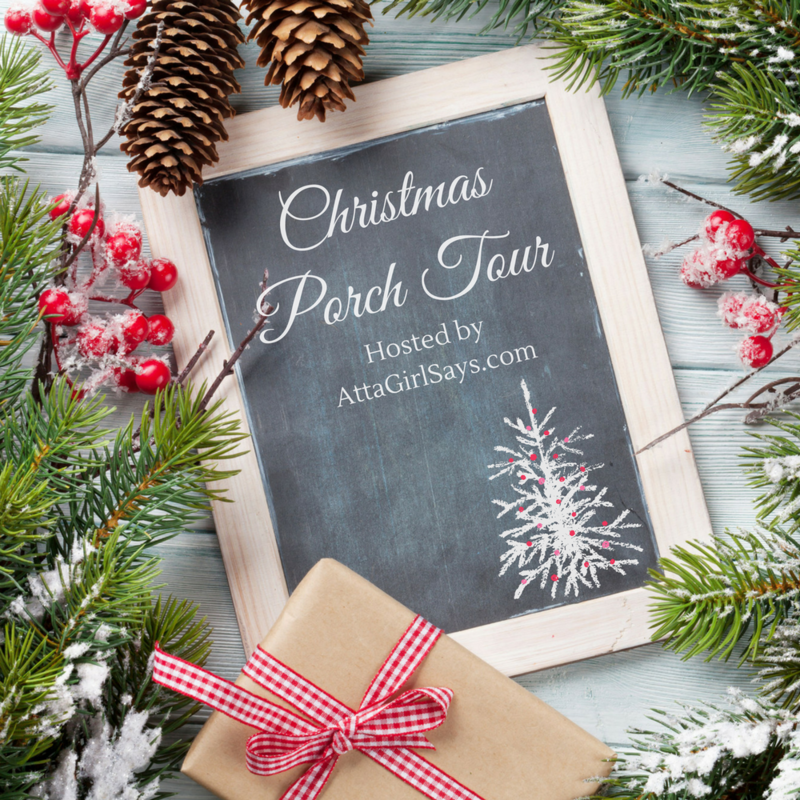 You’ll find links to their Christmas porches at the end of this post. 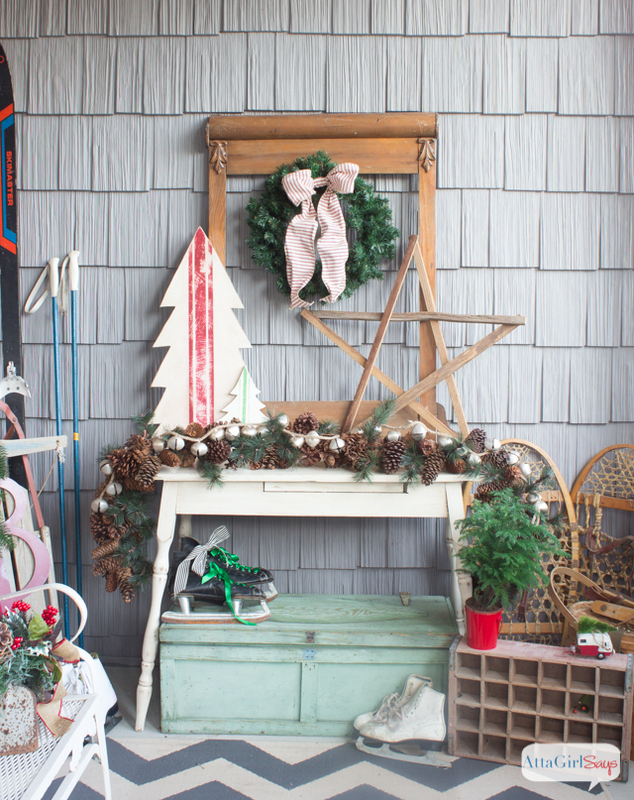 Whether your style is vintage, rustic, farmhouse, French country, traditional or cottage, you’ll find lots of inspiration as you deck your outdoor spaces for the holidays. 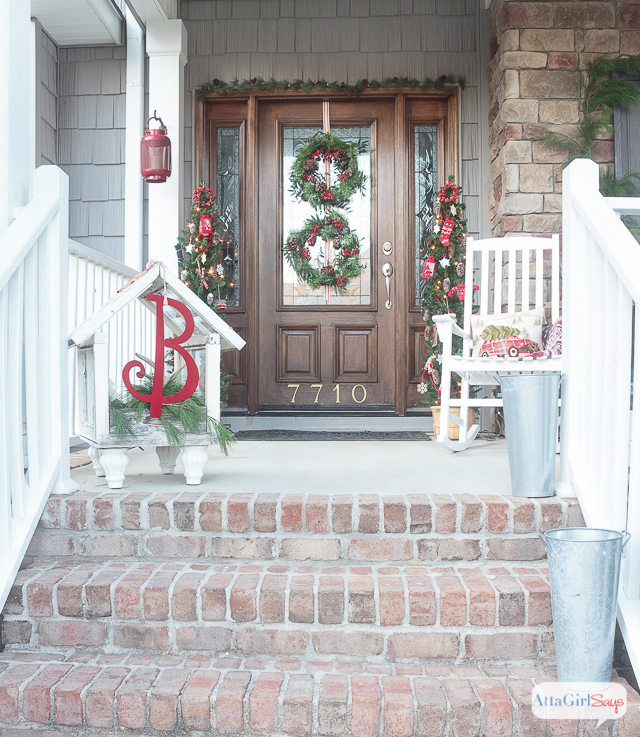 Every year, I use many of the same decorative elements on our front porch. But I like to switch up the theme because I get bored with the same-old, same-old. 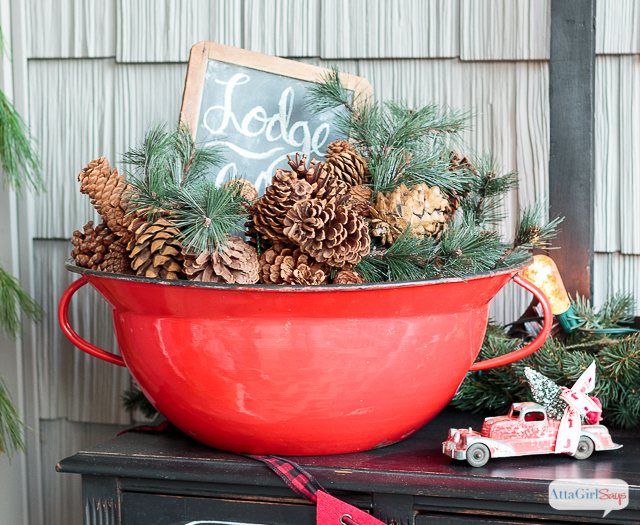 For this year’s holiday porch, I was going for a vintage lodge look, using traditional Christmas colors, winter sports equipment and vintage elements. 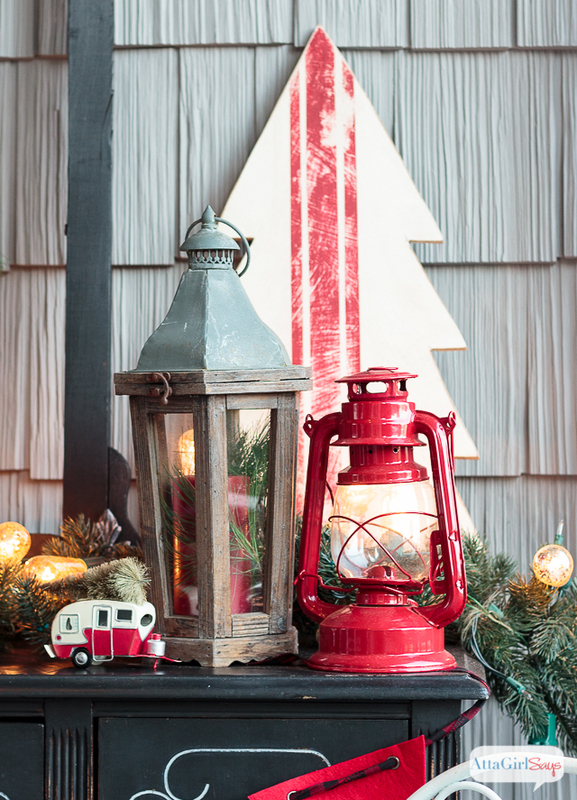 I want people to feel cozy and welcome as soon as they step up to the porch. 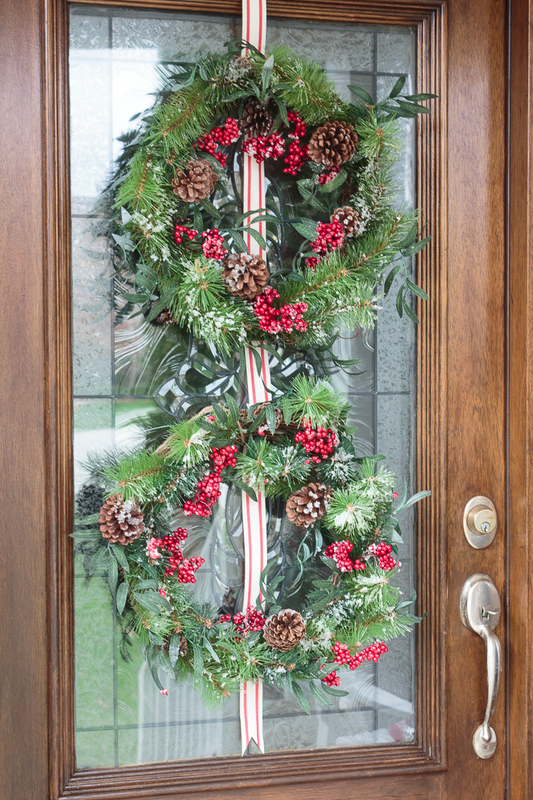 The darker door, decorated with two berry and pinecone wreaths from World Market, certainly helps with the lodge feel. 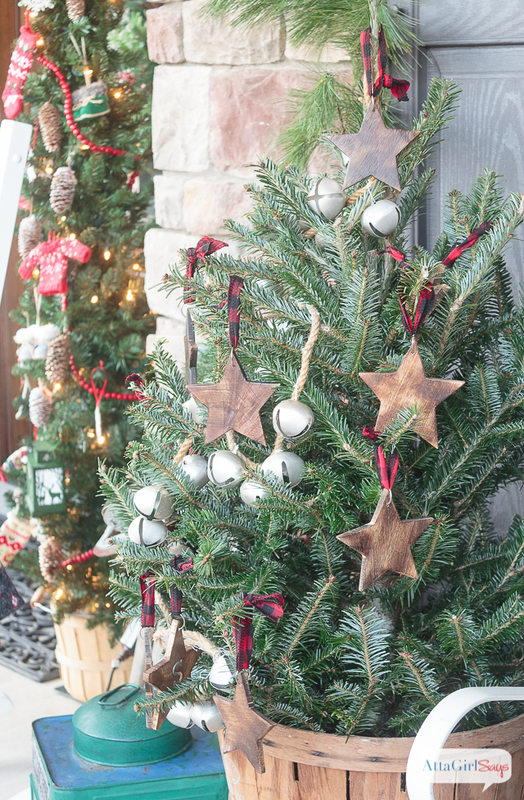 I decorated our two outdoor tree with pine cone ornaments, glittered wooden snowflakes and rustic and retro style ornaments. And I cozied up our rocking chair with a a vintage-style throw pillow and Fair Isle knit throw. 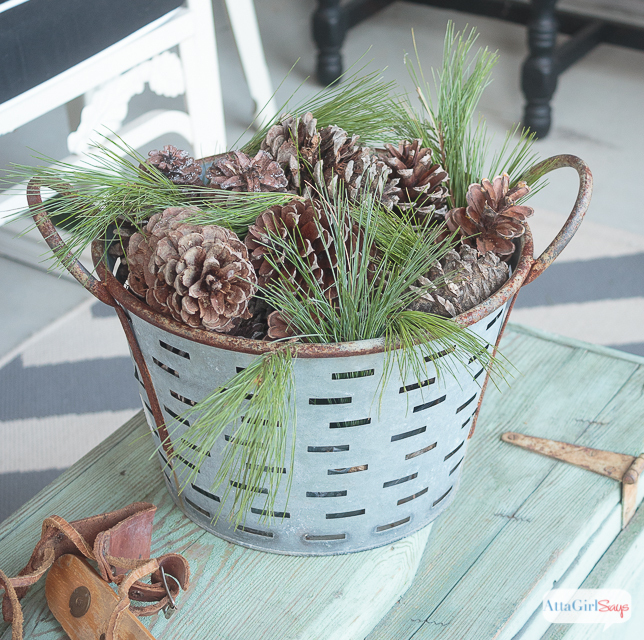 On the other side of the porch, I added some more vintage-style pillows to our glider bench and planted a live mini tree in a vintage bushel basket. 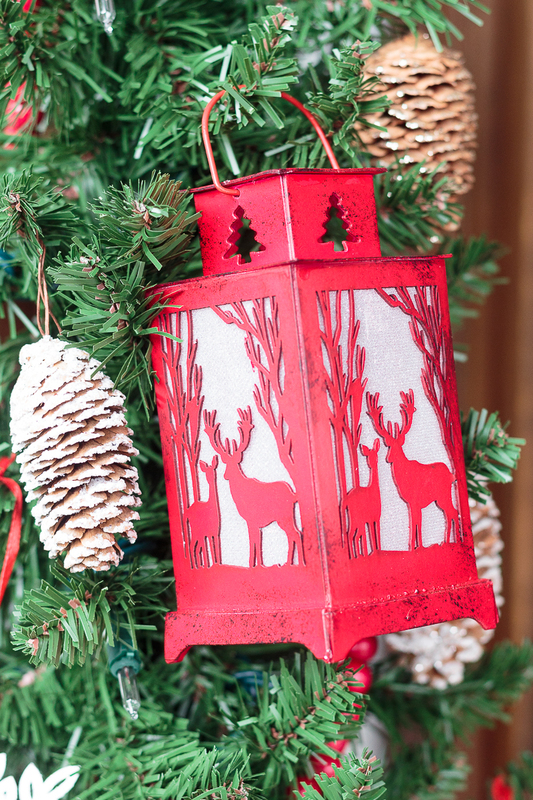 Sleigh bells and wooden stars on flannel buffalo check ribbon are the only decoration the tree needs. 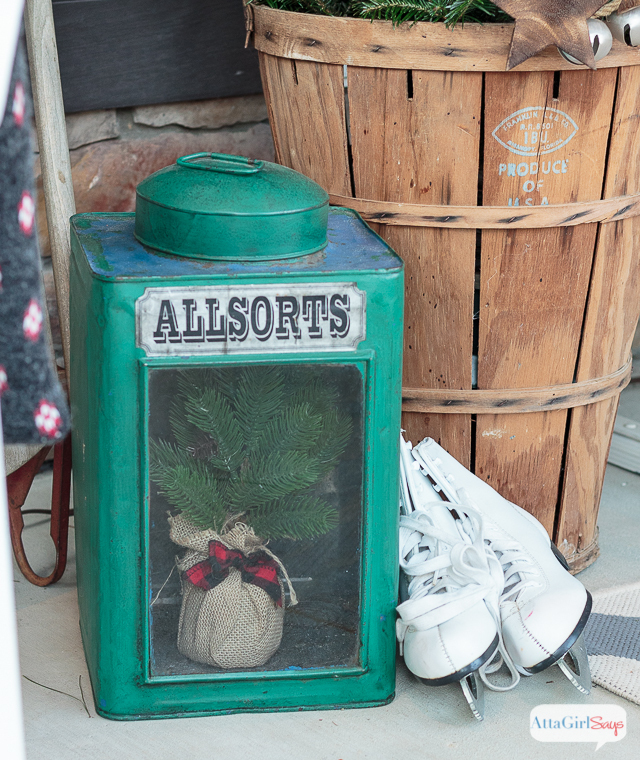 My vintage Allsorts tin was the perfect size for a burlap wrapped tree from the Target dollar spot. Even though I’ve only ice skated once (and spent most of the time on my rear), I have a fun little collection of ice skates that I love using on my porch. These wooden ones I picked up from a picker’s yard sale might be my favorite. 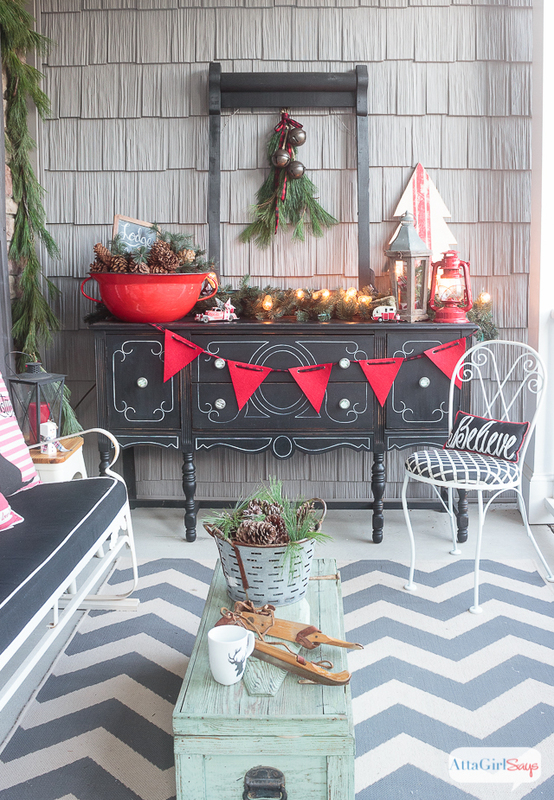 The wooden toolbox stays on the porch year round. 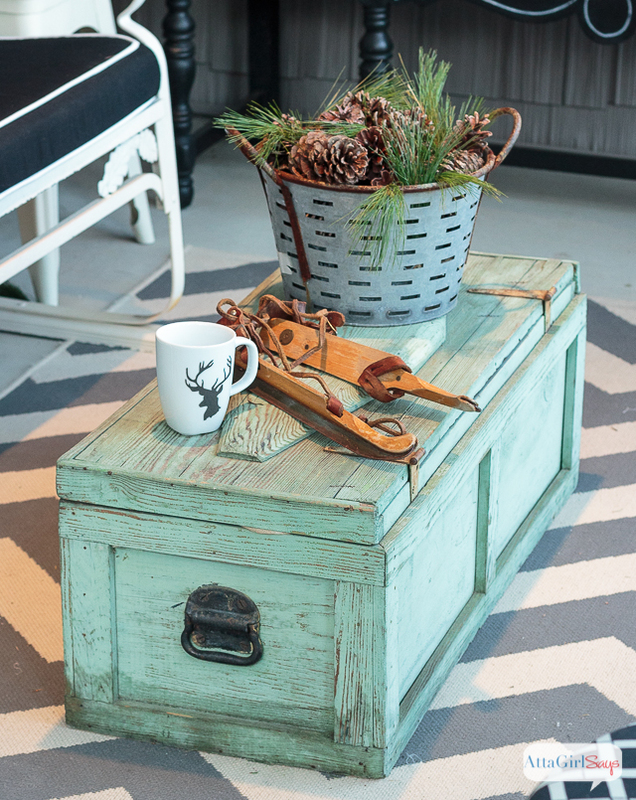 It’s a great coffee table or place to prop your feet. 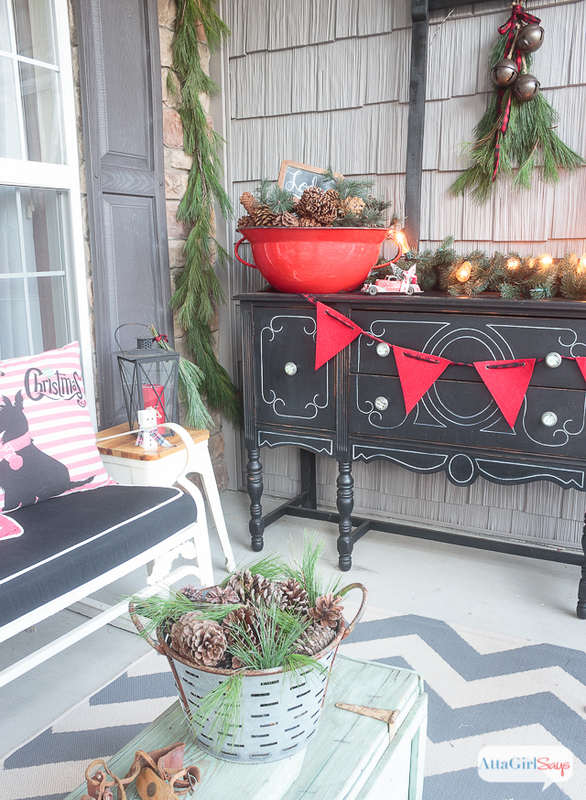 A few summers ago, I painted this black buffet for the porch, and this summer I added the bistro chairs. All were banged-up yard sale finds, so they’re fine to be outdoors. And since our porch is covered, they’re pretty well protected from the weather. I love figuring out different ways to decorate this statement piece of furniture season after season. The buffet is also dressed with a simple felt garland strung on buffalo check ribbon, some greenery and Edison style mercury glass lights. All capped with a pine swag adorned with oversized bells and more buffaloo check ribbon. I hope you’ve enjoyed this tour and I’ve given you lots of front porch decorating ideas for Christmas. There’s even more inspiration to be found on the other bloggers’ tours. 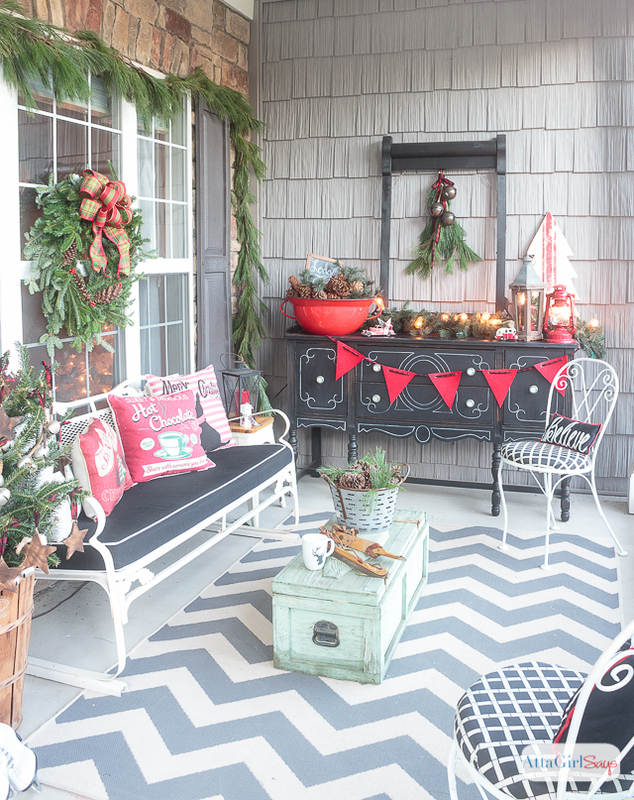 Click on the links below to visit all of these gorgeous Christmas porches. 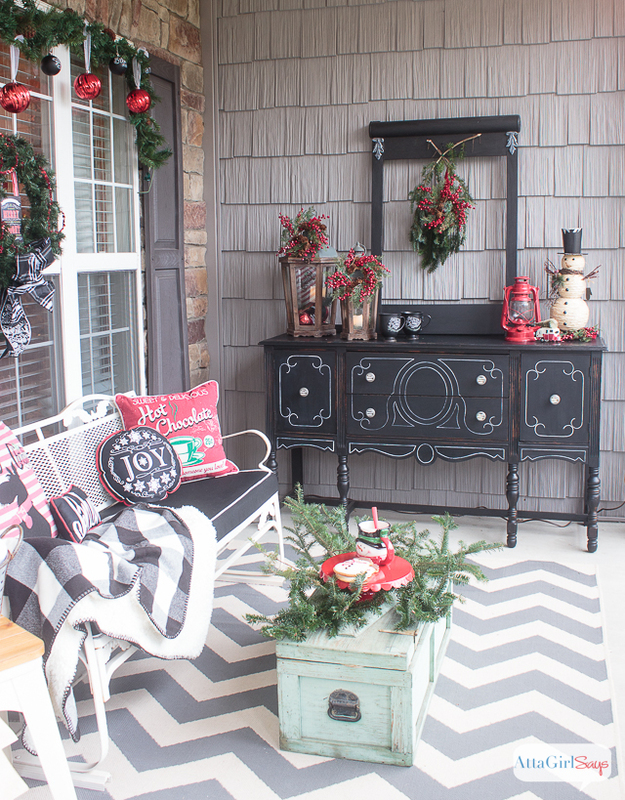 And don’t miss these past holiday looks at our home for more Christmas front porch decorating ideas. 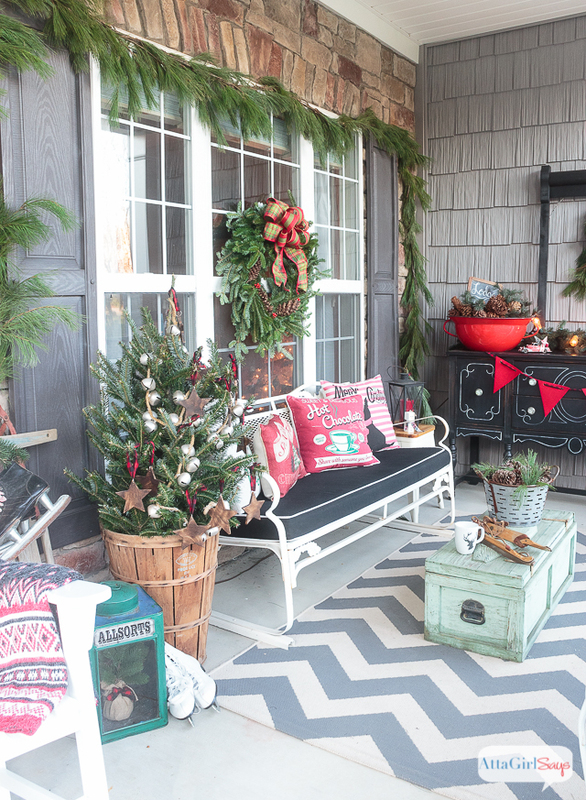 I love your porch any time of the year but it looks especially cozy at Christmas. All the vintage finds are fabulous. Thanks for hosting this fun tour! Your porch is just stunning! You have every right to be porch proud. I love all the touches of buffalo check too! Wow, wow, wow! I am so in love with your porch as always! I love how you have the server painted black. Might have to try that with my piece for something different. It’s been aqua for a while and really shows dirt/mold. So much inspiration!!! I appreciate the invite to the tour and all of your work to arrange it! The only drawback with black is pollen and dust. Pollen is not an issue in the fall and winter, but you can imagine what it looks like in the spring! Sue, here in central NC, we get some snow and ice, but nothing like you experience in Indiana. Ours is later in the season, so the porch is pretty well stripped down by then, and snow doesn’t really drift up on mine because we have a bank of large camellia bushes that provide some protection, too. Now, we have had crazy winds these past two days, and I’m going to have to go straighten some things up on the porch once this weather front passes. (My poor little tress fell over, even though I had them weighted. Thankfully, there was nothing breakable on them.) Mother nature doesn’t always cooperate with our decorating schemes. I’m glad you’ve enjoyed looking at the porches in this tour. 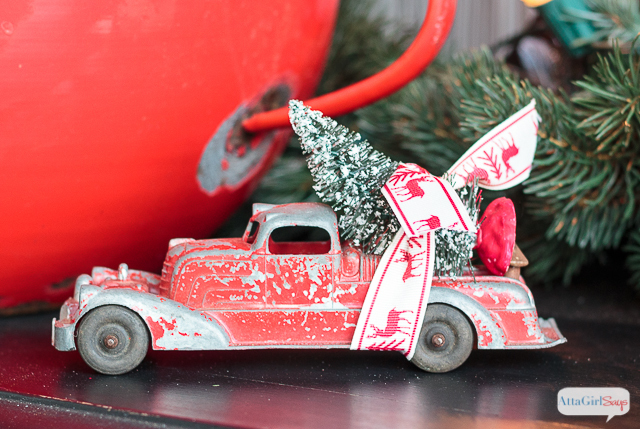 It’s so fun to see how people decorate and to get ideas from them. Love you porch, Amy! It looks so inviting and cozy! Ok how stinkin cute is your porch! 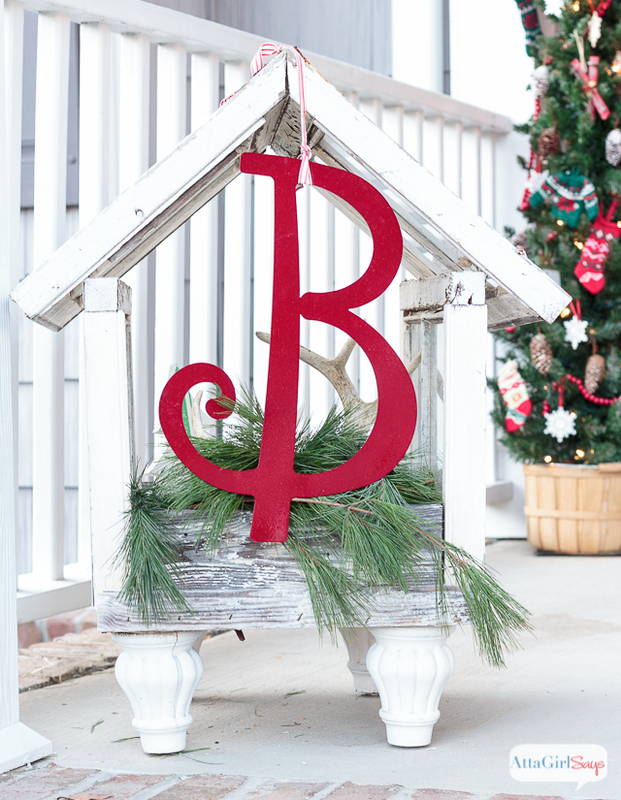 Those barn sales you speak of…oh my…Merry Christmas! Thank you so much. And aren’t barn sales so much fun? Dangerous, expensive fun! What a stunning porch you have created. It is so cozy and homey and welcoming! Just gorgeous! Thanks for sharing with us at the Share the Wealth Sunday link up!! Stopping by from Sunday’s Best Linkup. I’m having front porch envy. It’s beautiful. I love the red enamel pot, but the sideboard is to die for. Thanks for sharing. Hope to see you next week. Wow, it’s beautiful! 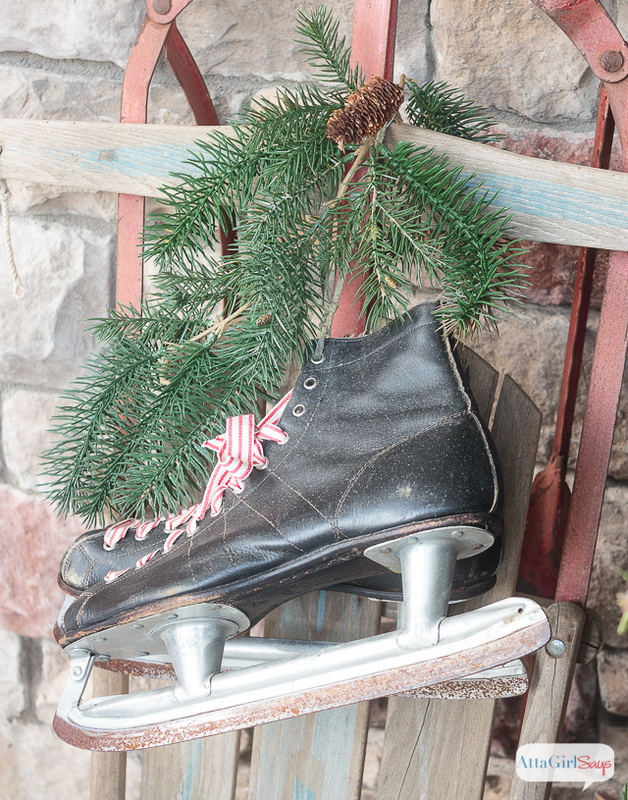 I love every thing about it from the black buffet to the skates to the grain stripe Christmas tree!! You can definitely be Porch Proud, it’s stunning! Thanks for sharing this with us at the DI & DI Link party. Hope you had fun, and have a great weekend! I long to have a front porch or back porch one day 😉 Yours has me dreaming! Aw, thank you. 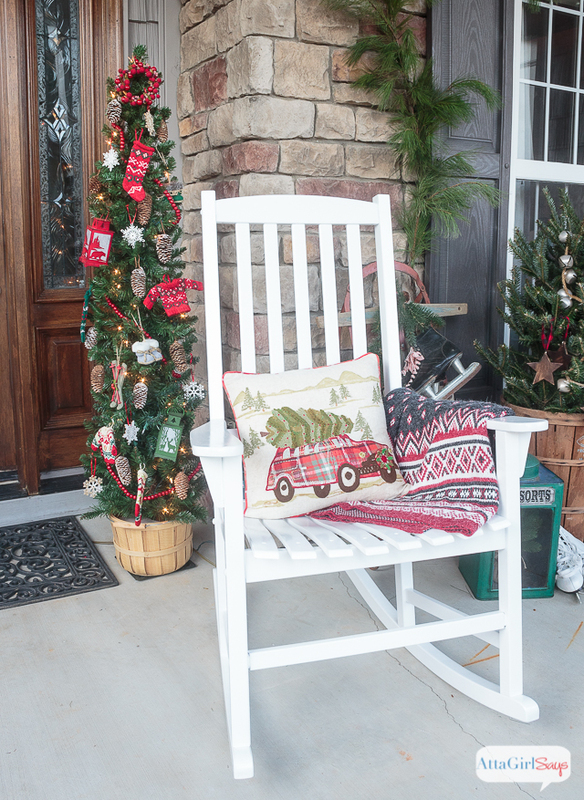 Hope your porch dreams comes true soon. Amy, where did you find your white glider? The glider is an antique/vintage piece from a friend.